Owned by Susan Maffei Plowden of Jamestown, RI. She was found in an old mill in Wickford, RI where she had been stored by the Reiser family (E. Greenwich, RI), who had owned her since the '60's. 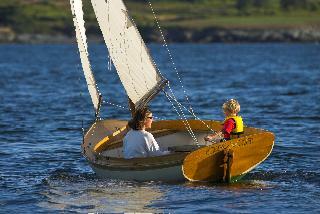 She has been fully restored by John Plowden and a couple of students from the International Yacht Restoration School. Grace was relaunched in Oct. '01 in Jamestown, RI. Original parts include all planking (exc. garboards), keel, sheerstrake, seats, mast/spars. New parts incl. the transom (oak), toerail and covering boards, floors, ribs, bulkheads, floorboards, and standing and running rigging. Most of the hardware is original, though there are a couple of parts from J. Reineck.